Over the last little while I’ve been working on a technique of recycling wool scraps. As I knit over a hundred pounds of wool each year, I have a lot of ends that are clipped off of finished pieces that would normally go into the waste bin, and then the landfill, but in the back of my mind I have always thought there is a way to avoid this situation. Through experimentation, and a LOT of time, I discovered I could strip down the scraps and re-spin them. I spin by hand on a Turkish spindle. I have knit, in the past with the yarn created from the first re-spin. For the project I am currently working on I decided to ply re-spun to re-spun. This creates a thicker yarn. I will admit it is a weird ply and it creates a sturdy yarn. 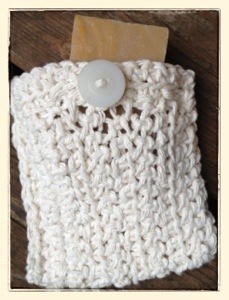 This type of yarn is a good fit for the project I am working on, a mini cross-body bag. It is quite interesting to explore the idea of taking waste fiber and turning it into a functional item. This concept still needs further exploration, but it is definitely forward thinking. A new opportunity has arisen and I am pretty excited about it. 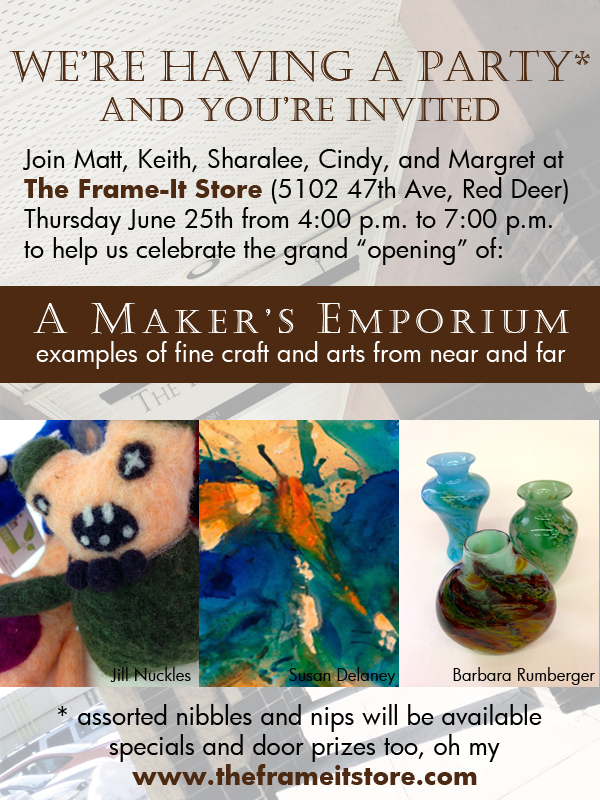 The Frame It Store in Red Deer, Alberta (Canada) has added a new gallery to their venue, and my Wine Wraps and Bottle Sweaters will be for sale in this new space. Both items dress up your bottle while keeping the contents cool. All are hand dyed in natural dyes and hand knit. The wool is 100% Canadian produced wool and milled in Alberta. The new gallery space, “A Maker’s Emporium”, is having its grand opening this Thursday. If you are in town, come and check it out. It’s great to see new things happening in Red Deer’s creative community. The donations for the silent auction for the Our Lady of Victory Camp are all ready. This selection includes a Wine Wrap, Coffee Sweaters, a Coffee Mug Sweater and some naturally dyed and hand tied bracelets. All the knit items are made of 100% Canadian produced wool milled in Alberta. The dyed items are all hand dyed in micro batches of hand crafted natural dyes. Each item is created completely by hand. For information on the gala taking place on May 8th, please click HERE. Knit items by Studio H (Debra Hunter) can be found at Sunworks (Red Deer, AB), The Whyte Museum Store (Banff, Alberta) and at Woods on Pender (Pender Island, BC). For more information on the items offered, we can be contacted through our website at www.debra-hunter.com . Coffee Press Sweater naturally dyed in indigo, chamomile, pomegranate and turmeric. The Coffee Press Sweaters for Woods on Pender (Pender Island, BC, Canada) are complete. The sweaters will be dressing the coffee presses (and keeping coffee warm) in the accommodation units at the newest resort on the island. Each Coffee Press Sweater is made of 100% Canadian produced wool that is milled in Alberta. The wool is hand-dyed in micro batches in natural dyes that I craft by hand. In keeping with the resort’s colors, the items feature colors created with marigold (right from our gardens), chamomile, pomegranate, turmeric and indigo. The Coffee Press Sweaters are knit by hand and proudly display the resort’s logo in the center band . 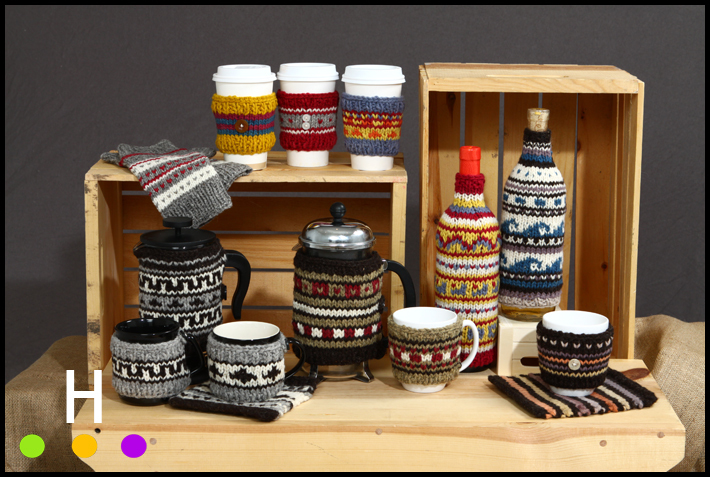 In addition to creating custom Coffee Press Sweaters for boutiques and the hospitality industry, we are always thrilled to sell our lovely handmade items to individuals. 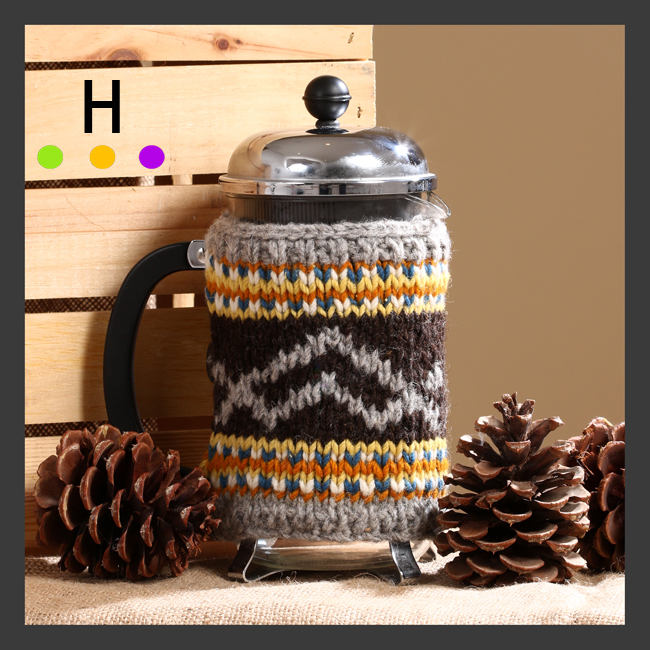 If you are interested in a Coffee Press Sweater we can be contacted through our website www.debra-hunter.com. 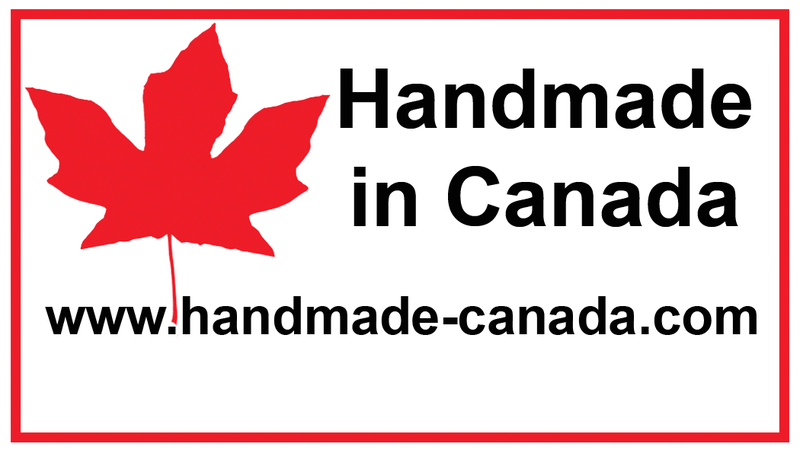 We also profile our work at www.handmade-canada.com , a brand new site for Canadian artists, artisans, writers, musicians and growers. If you are a Canadian maker, please take a look as we are currently looking for new makers to join our project. Well we’ve been having fun for the last few days toying with Instagram, and fun it has been. 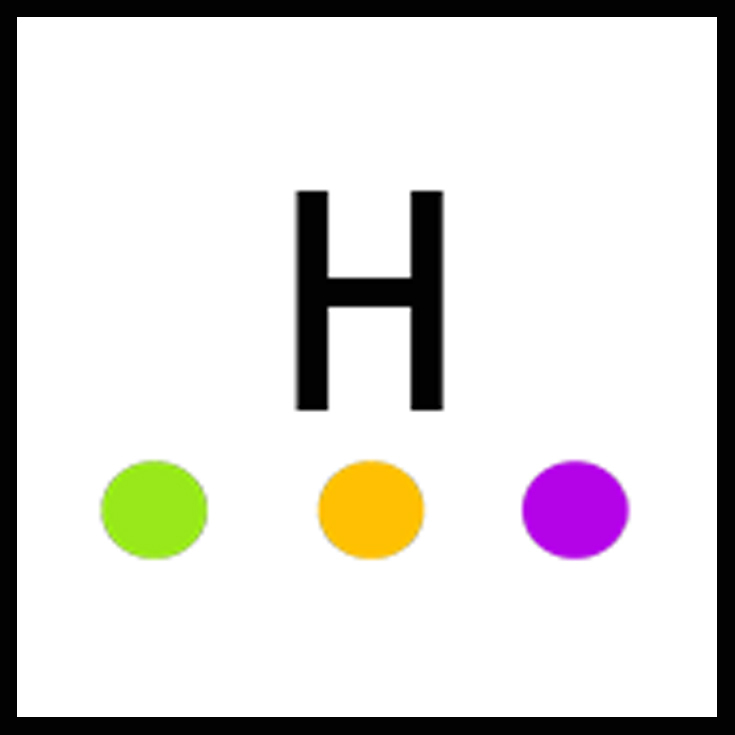 It seems to be a fun and fast way to share what we are up to, especially works in progress. 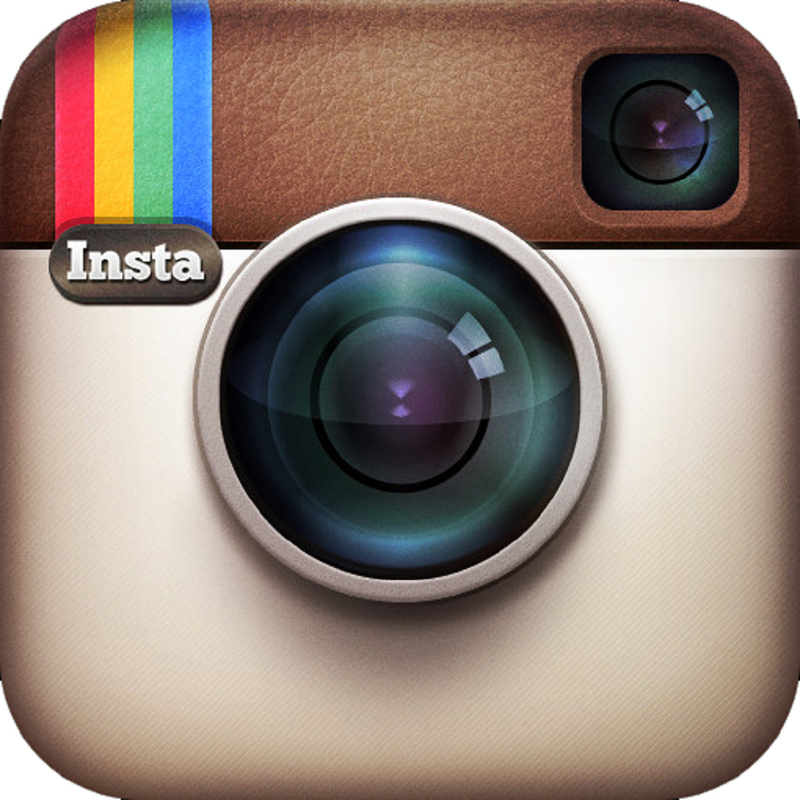 The latest Instagram entry will now show along the sidebar. You can also find us by clicking HERE. I hope you’ll follow us! Today’s image is of a small collection of the knit items I create. 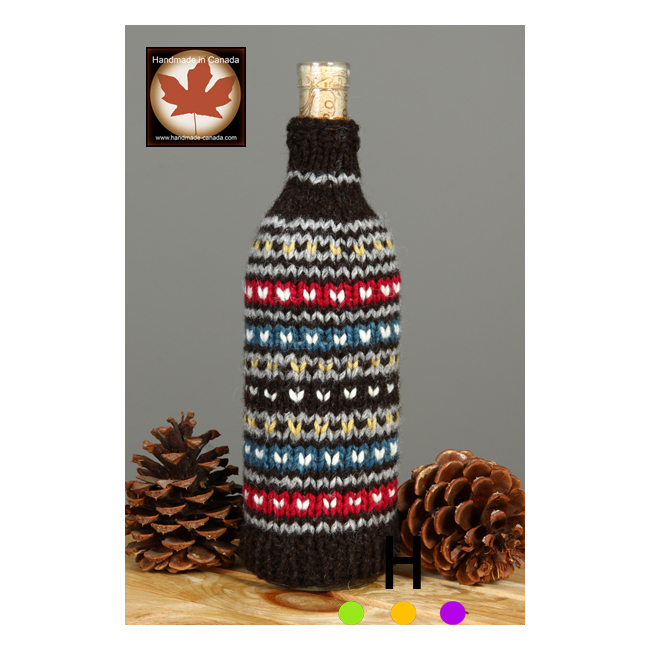 The items include Coffee Sweaters, Coffee Mug Sweaters, Coffee Press Sweaters, Coffee Carpets, Wine Wraps, and fingerless mitts. All items are hand knit and made of 100% Canadian produced wool that is milled in Alberta. The wool is hand dyed in natural dyes that I craft by hand; some of the dyes, such as marigold, I grow in my garden. I photographed this image for use in a collective I am in the process of forming. I will share the details of the project here once all the details are finalized. Items are available from me directly through the website, at Sunworks (Red Deer, Alberta) and at the Whyte Gallery Shop (Banff, Alberta, Canada). 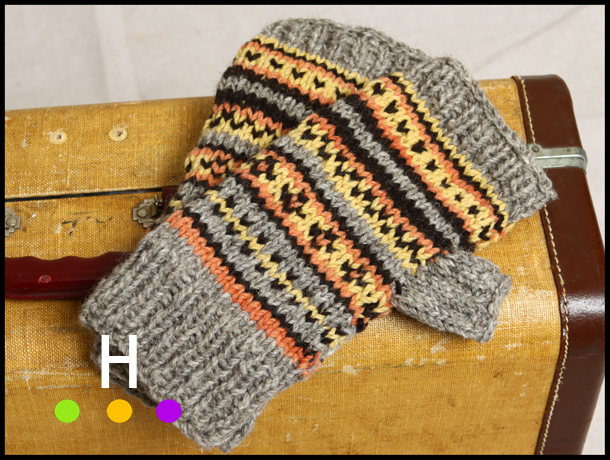 A brand new pair of fingerless mitts has just been completed. 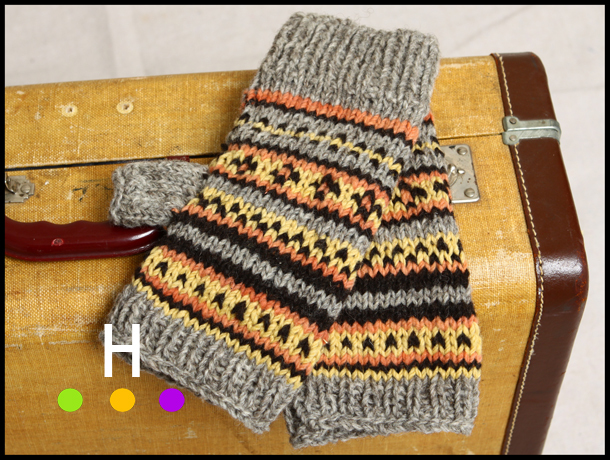 The mitts are made of 100% Canadian produced wool that has been hand dyed in natural dyes (marigold and madder). 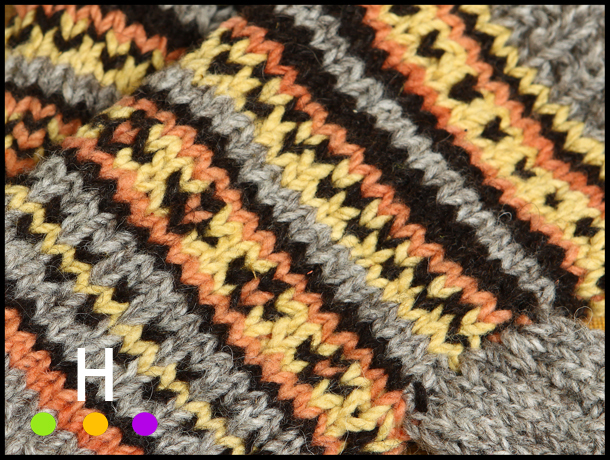 Four color stranded knitting makes for lively patterning and a bit of fun. These fingerless mitts give an almost full thumb coverage, plus coverage to the beginning of the fingernails allowing for maximum warmth while still having fingertips available for texting or using a camera. The past week has been great for knitting and crochet. I am working on some new home items plus building up a supply of Coffee Sweaters for either the next order or perhaps to finally get a shop up on-line, one of the goals for 2015. The last week has been spent creating a few new handmade items for the home. Having a handcrafted item that is also functional is a way to add a little luxury into everyday life. Here is a sneak peek of one of the new items. 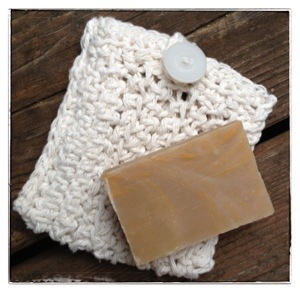 This “Soap Wrap” is made of un-dyed USA grown cotton and is hand crocheted. It is a great companion for artisanal handmade soaps, and a nice way to add an artistic touch to your bathroom. I’ll be sharing more “Soap Wraps” here in the near future. 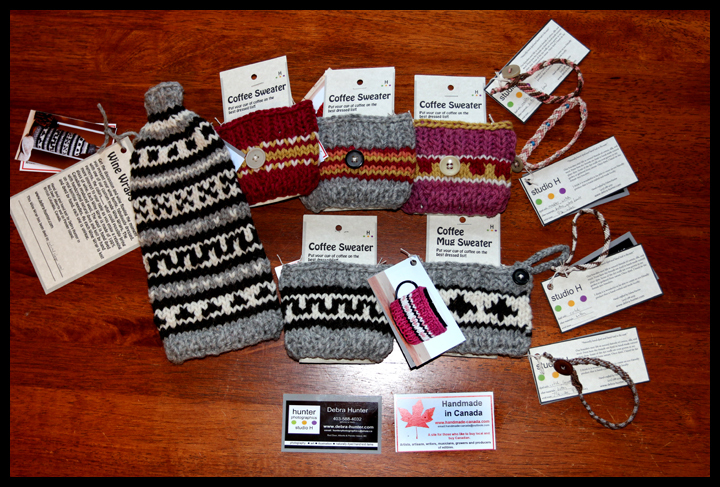 Another set of Coffee Sweaters were dropped off to Sunworks yesterday afternoon. The last batch sold FAST. I am starting to see my knit items pop up in use around town which is pretty fun. This new group sports some brighter colors and bolder patterns. They are all hand knit and naturally hand dyed of Canadian produced wool that is milled right here in Alberta. Sunworks is located on Ross Street in Red Deer, Alberta. It is a great place to look for niche items that make for special gifts. And so the paint meanders…..